November 20, 2012 – On this birthday, His Holiness Patriarch Kirill of Moscow and All Russia celebrated the Divine Liturgy at the domestic Chapel of All Saints Who Shone Forth in the Russian Land in the Patriarchal and Synodal residence in St. Daniel’s Monastery, Moscow. Praying together with him were members of the Holy Synod, representatives of Local Orthodox Churches, ruling bishops, heads of Synodal departments and units, abbots and abbesses of stauropegial monasteries, clergy, monastics and staff members of the Moscow Patriarchate. Petitions were lifted up for Patriarch Kirill’s health and for the wellbeing of the Russian Orthodox Church. The congregation also prayed for the repose of the souls of the ever-memorable Patriarchs Sergiy, Alexis I, Pimen, Metropolitan Nikodim (Rotov) and for the late parents of His Holiness Kirill. After the liturgy, Metropolitan Juvenaly extended congratulations to Patriarch Kirill on behalf of the Holy Synod. He said in particular, ‘Speaking about the time of your patriarchal ministry, I would like to make a special mention of the fact that your voice addressing the modern world and man calls to return or turn to Christ’. Metropolitan Juvenaly presented His Holiness with a cucullus, roses and an image of Our Lady of Smolensk with General Kutizov and Russian soldiers praying at her icon in 1812. Archbishop Arseny of Istra greeted His Holiness on behalf of vicar bishops, deans, clergy and laity in Moscow, saying, ‘Carrying out your service in this great historic city, you proclaim peace and love and call people to become aware of their past so that they may not commit the mistakes our compatriots made in the last century’. Speaking briefly in response, Patriarch Kirill thanked all for the kind words and prayers together with him on that day. ‘I have never in my life celebrated this day publicly. But due to my position in the Church and at the request of those who work together with me, the decision was made to celebrate this day this year in such a way that my closest co-workers and those who wished could pray together with me. They are really my closest co-workers with whom we work side by side every day. These are abbots and abbesses; these are people who are bonded with me and my life in some way. And I cordially thank all those who have come today to share in this prayer’. The reading of the Gospel from Lk. 12:48-59 for the day, he said, reveals the meaning of the patriarchal ministry and of any important work. ‘Its point is that one who is given much will have to answer for much. This text is very sobering and not only for a patriarch at that. It should sober everyone, especially the ones who have power, be it in a Church or in a state. God will call to account those who are given much. It means that our ministry involves not only spiritual delight at fellowship with people, not only certain external privileges it offers, but also suffering inherent in this ministry. It concerns the patriarchal service, the service of every bishops and the service of everyone who is given power and responsibility by God. 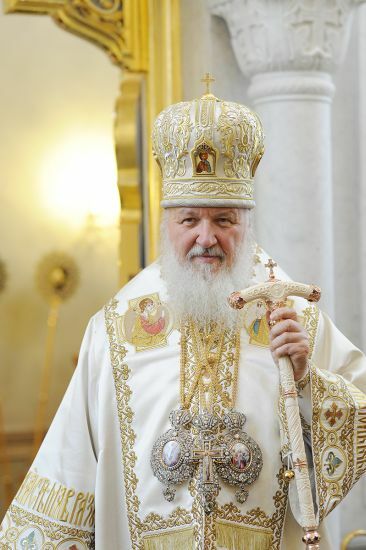 Therefore, I have prayed today that we all and everyone and all together as a Church may be worthy of the great calling to which God has appointed us’, His Holiness Patriarch Kirill said in conclusion.